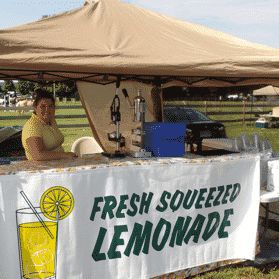 I’m going to make this super simple and teach you exactly how to make a lemonade stand. Fancy or on a budget… it can all be done quickly. A citrus smasher or muddler or juicer of some sort. By far – the citrus juicers are the best – PERIOD! and last but probably the most important… signage! Signage is key! That’s really all you need. And for direct links and ideas on these items, check this out. 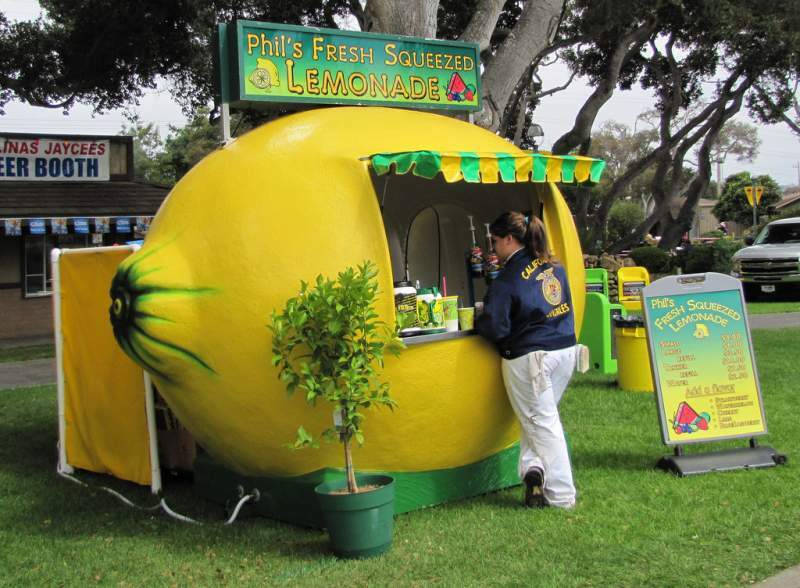 Some vendors go all out when doing their lemonade stand. 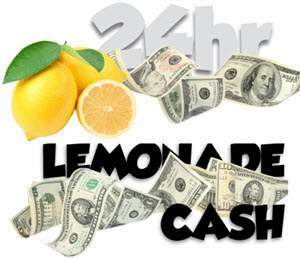 I’ll show you how to make a lemonade stand using very little money and will also show you more expensive ways you could go about it. Obviously you’ll want and need some other things but this is the super budget bare minimums. And we can go even cheaper. You can rent a canopy and you can even rent tables for about $5.00 a day. Check out local party supply rental companies. We’re talking Pinterest loving DIY here. If you’re handy, you could take scrap or salvaged lumber and build a table or two. You could also do it with pallets. Pallets can be had absolutely free from many hardware stores, like Ace Hardware. I once built an entire walkway to a koi pond out of about 50 pallets I got for free. 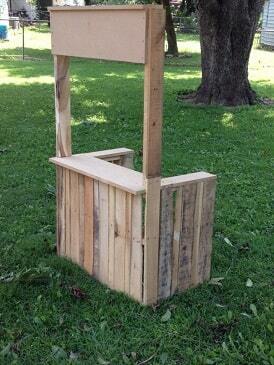 Although free stuff, a table made from wood will be heavier and it’s likely that you’ll be at different locations. I’d avoid this a DIY lemonade stand from wood. A basic stand with popup canopy and foldable tables. – Your best bet! By far! 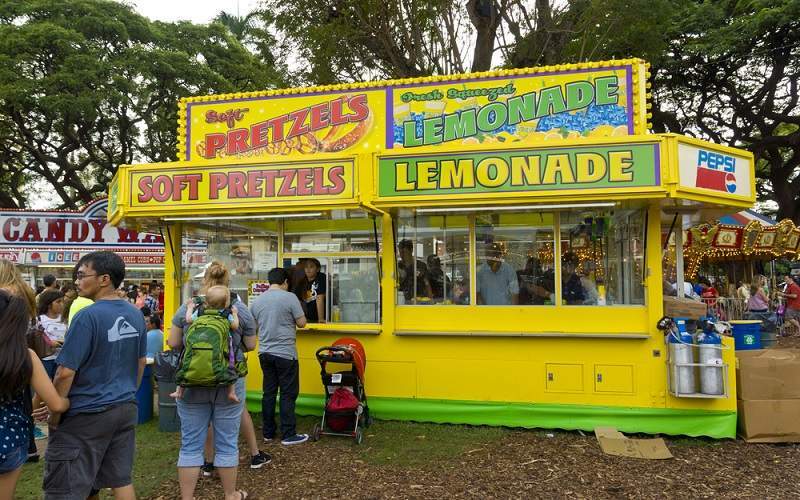 Professional food trailer will set you back tens of thousands. I’ve set up next to these monstrosities and still outdid them with my little setup. A beautiful setup for a permanent location. But mobile vending is where the money is. 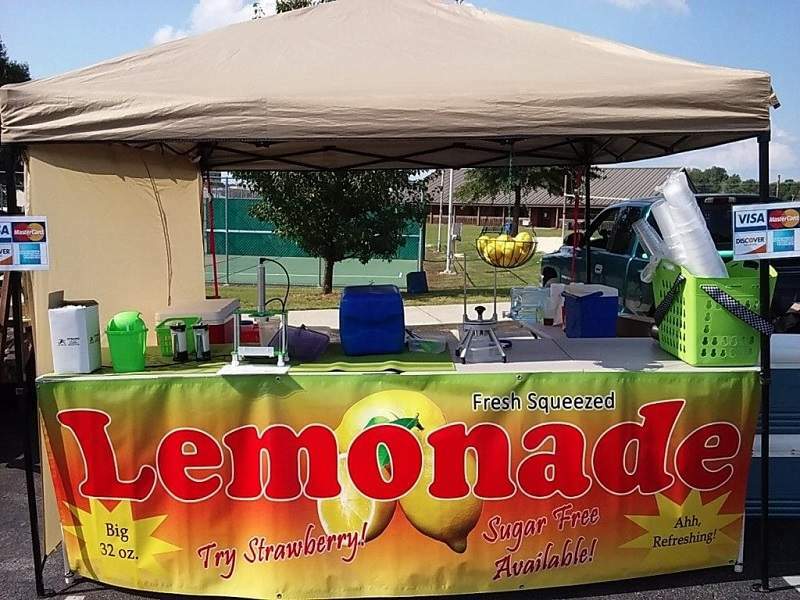 You can also check what is a good price for a lemonade stand in this ARTICLE. Instead of spending thousands on the fancy equipment – Jennifer invested in marketing. 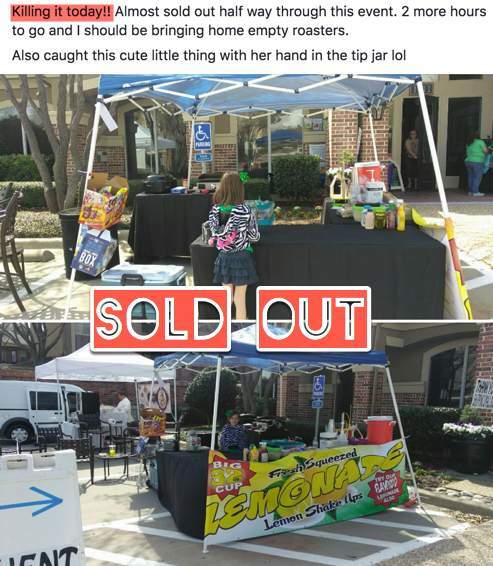 Jennifer has become known as the Lemonade Lady in her Texas town. As a single mom, she vends a lot. Her daughter Phoenix helps out and can completely run the entire setup all by herself. Her marketing efforts have paid off. She’s booked all the time. Good luck getting in.